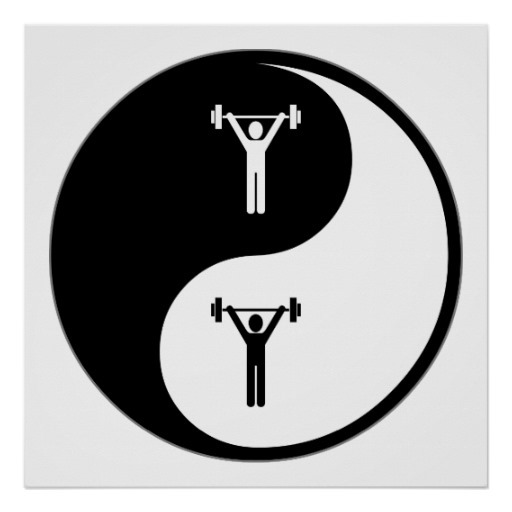 The Yin Yang of Exercise is just awesome. Get this fundamental concept of Eastern though and it will transform the way you look at exercise and program design. In this article I'll reveal to you the Hidden Connection Between A German Strongman and a Chinese Daoist and the ancient secret of the Taiji, "the Grand Ultimate Truth" and how you can use it to take your workouts to the next level. It's no secret I'm a martial arts buff - heck that's why I got into Isometrics and physical fitness and strength training in the first place. It was to be a better martial artist. Today I've trained with best classical and modern martial artists in the world. I've sat at the feat of masters and I've learnt from them. I've been shown the secrets of thier incredible strength and today at 179 lbs (at time of writing) I can bench press 633 lbs in my strongest range of motion. This is is for Jakob - he recently "called me out" about my claims. He said he wanted video proof that I could bench press over 600lbs in my strongest range as I've claimed I can. Done. I can do this and other incredible feats of strength with VERY little time spent training. In fact, I spend less than 5 minutes a day on my strength training on average. I can do this, and you can too, thanks to my knowledge of Yin and Yang - two very important concepts in the martial arts and in Traditional Chinese Medicine (did I mention I'm an internationally recognized expert in TCM?) and how they can be applied to exercise. I call it "The Yin Yang of Exercise". Within Traditional Chinese Medicine and Japanese Medicine, the greatest underlying concept pervading both is Yin and Yang (In and Yo in Japanese). The comes from underlying Daoist philosophy that permeates all aspects of health in China and Japan from diet, exercise, the martial arts and even military strategy and where to build your house. I think nearly everyone has heard this expression by now. Many people are familiar with the terms Yin and Yang, but haven't been educated as to what they mean. Yin and Yang are nothing more than a concept that explains and highlights contrast. Everyone is familiar with the concept of opposites, and in TCM this is the fundamental basis of all understanding. Yin literally means the shady side of a hill, and Yang is the sunny side. In TCM these terms were expanded to show the varying contrast between all things. For instance, Yin is water, Yang is fire. Yin is dark, Yang is bright. Yin is mental or emotional, Yang is physical. Yin is passive, Yang is active. And perhaps the greatest contrast, Yin is female and Yang is male. Humans have always understood the nature of their world through contrast (night/day) and our perception of physical reality is grounded in such concepts. In Chinese medicine, Yin and Yang are simple ways of illustrating this concept in terms of the energy of the human body and its relative health. What has this to do with Exercise? Good question. What is The Yin Yang of Exercise? What is the Yin Yang of Exercise? There are many different ways of understanding Yin and Yang, or In and Yo. In Traditional Chinese Medicine Yin refers to the passive functions of our internal organs, and Yang refers to the active functions of our internal organs. Within Martial Arts it means the difference between internal (Yin - such as Qi Gong or Tai Chi) and external (Yang - Shotokan for instance) styles. Within the construction of a sword it is the soft (Yin) and hard (Yang) metals. And within the training of the human body it is the combination of internal energy work known as kiko in Japanese and the external contraction of the muscles, tendons and sinews. In reality it can be very hard to judge where one begins and the other ends and this is how it should be as Yin and Yang and mutually engendering, transforming and transporting. It is in their nature to bleed into and create the other. Within the practice of Isometrics however and the techniques and arts found within Samurai Strength the Yin is the slow build of tension, the focus of breathing and the development of internal power and Ki. If we maintain awareness (zanshin in Japanese) we become aware of the cues and signals of the body in generating our physical power and tension (Yang). The breathing changes, the blood moves, the abdomen begins its contraction for our Tanden breathing (covered previously in Volume 1: Isometrics). We can take conscious control of these and expand of our awareness and control into the precise contraction of our muscles. ".....mechanical exercise will only produce good results if interest is directed to the muscles being used. If the mind is directed only to the work being preformed, a certain point of muscular resistance is reached; but not there it stops. To secure full benefit from the exercise, it is essential that the mind be concentrate on the muscles"
I think this is incredible. That the ancient Chinese Daoist martial arts masters and a German strongman both recognized the importance of a focused mind on muscular development. The deeply focused mind must be engaged in each contraction and each exercise in this series in order to derive the maximal benefit and strength of the muscles. This is the Yin Yang of Exercise. With the realms of physical exertion there is a development of skill - Isometrics are rapidly learnt form of exercise as they need no movement. That said it still takes skill to learn the interplay of muscles and their contraction. It is a unique combination of mental focus and physical exertion. There truly is no other training like it. In your workouts and Isometrics, practice developing your mind and muscle connection. Come back here and post how you feel after a week below. I'll be looking for your comments and will keep you on track. Finally, if you're looking for a more comprehensive program or more isometric exercise help check out my new program Samurai Strength! You've been reading about the Yin Yang of Exercise. Check out this great article on Isometrics for Strengthening Tendons and Ligaments.